All new AC powered Golf Carts! They have twice the horsepower of a DC powered cart, are more energy efficient and will travel 19 mph! If you need to access the motor control unit and vital electrical components you have the advantage of the largest access panel in the business. Open it up and make it happen. Exactly how important is an armrest? Depends on whether it’s done right. Ours is strong, made of steel-reinforced, glass filled polypropylene. It’s larger and wider than previous models, but it doesn’t interfere with entry or exit. It’s substantial enough to provide comfort and security for the occupants—and if that’s not important, what is? The auto industry spent a hundred years getting this right, so why not use it? We gave it four cup holders to hold different-size cups; a center storage area for wallets, cell phones, and personal items; six ball holders; six tee holders; and a big, easy-to-clean storage compartment on each side. It even has 2 USB charging ports and a voltage meter! Deep, supportive contours are intended to help hold occupants in place while the car is moving. Designed to accommodate occupants of all different heights and sizes, it’s made of pure, supple foam bonded to a seamless, fabric-backed vinyl cover, and the polypropylene seat base is strengthened with plated steel inserts. Won’t sag or warp, stands up to repeated pressure washings, and remains the most comfortable seat in the business despite daily abuse. Our top is wider and extends farther in the front for maximum occupant protection, and it’s longer in the rear to give maximum protection without interfering with the clubs. It has the only 360° double rain channel in the industry, and its integrated water drain system has an exclusive clog-proof design. It’s built for rattle-free stability and has integrated grab handles. So who’s afraid of a little rain? 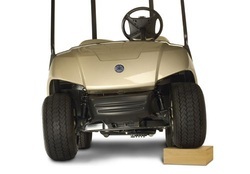 Notice how one tire stays firmly planted, even though the other adjusts to the terrain? That’s the fully independent suspension at work. We designed a maintenance-free suspension using automotive-style, coil-over-shock struts to minimize roll and deliver a smooth, comfortable ride. Sooner or later, some golfer will offer to trade his car for it. you can replace them by removing only two bolts. You know that really gross stuff that collects in the bottom of cup holders? We don’t have that. Our cup holders are built with drain holes that keep liquids and debris from accumulating. And they’re removable, so cleaning them is a snap. ​Platinum Stihl Dealer, Ferris, Snapper, Snapper Pro, Hustler, Big Dog, Altoz, Pressure Washers, Yamaha Golf Carts, Aluma Trailers. Frontage Road, I-4, Plant City, Hillsborough County.